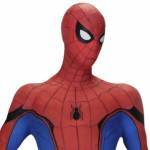 At Toy Fair 2017, a new Spider-Man: Homecoming – Life Size Foam Figure was revealed by NECA. They have no released details and an official image for the statue. Ships in two boxes. Very simple assembly required; assembly and care instructions included. The foam Spider-Man statue is scheduled for release in June. Click the thumbnail for the full size photo. NECA's gone size crazy lately! Nice but I got no place for 1/4 figures, much less for this Spider-Man naughty doll... er... "foam statue". I'd rather NECA do a 1:1 scale chestburster. If they sell these to individual collectors, I'm guessing that's a bonus. But I see these mainly at comic shops as display pieces. One in my area has a DC Comics themed life sized figure area where people can come in and take photos with them. I'd love to own this but no doubt out of my price range.